MAIDUGURI, Nigeria – Traditional hunters armed with homemade guns, poisoned spears and amulets have gathered in their hundreds, eager to use their skills and what they believe to be supernatural powers to help find nearly 300 schoolgirls abducted by Islamic extremists. With Nigeria's military accused by many citizens of not doing enough to rescue the girls, the hunters demonstrated their skills to an Associated Press reporter on Sunday. With cow horn trumpets echoing eerie war cries from the screaming and chanting men who twirled knives and swords with dexterity, occasionally stabbing and cutting themselves with no apparent harm. The hunters claimed their magic charms prevented any blood being drawn. They also trust amulets of herbs and other substances wrapped in leather pouches as well as cowrie shells, animal teeth and leather bracelets to protect them from bullets. 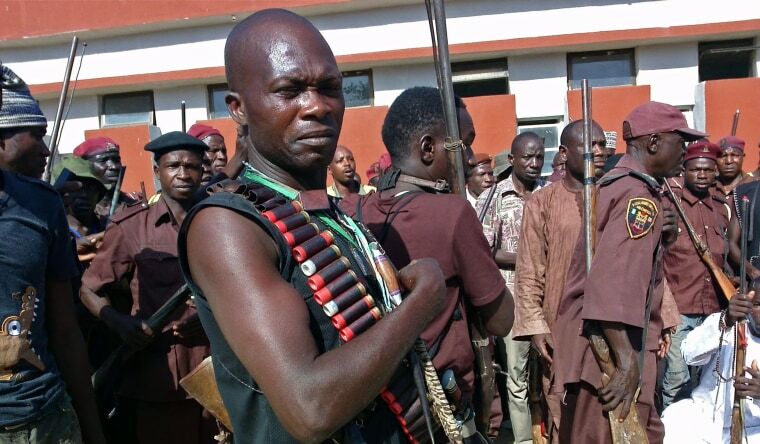 The appearance of the hunters from three northeastern states underscores how deeply the April 15 mass kidnapping — and the government's apparent lack of action — has affected Nigerian society. It has spawned demonstrations and a tidal wave of commentary in media including social sites like Twitter and Facebook.